KOKOMO, Ind. — Indiana University Kokomo hosted the IU Board of Trustees in its December meetings. 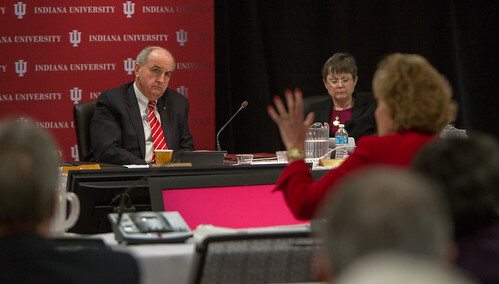 IU President Michael A. McRobbie listens to Interim Chancellor Susan Sciame-Giesecke as she presents her update to the IU Trustees.Interim Chancellor Susan Sciame-Giesecke told the trustees and President Michael McRobbie that IU Kokomo is moving forward with its central mission of teaching and learning. "Our faculty and staff have continued the momentum," she said. "We are focused on President McRobbie's challenge of improving degree completion and student retention." She highlighted the Complete in Four program, designed to push students to graduate in four years, and changes in summer school, including addition of a Maymester, in which students can take one class in one month, to earn three credits. She also presented the junior mentoring program, which pairs third-year students with faculty in their major area, to discuss their future plans. In addition, she talked about the campus' math readiness initiative with Kokomo High School, giving the math placement test to all 700 seniors, and then assisting high school teachers to make sure the students are ready for college math before they enroll. In facilities news, she told the trustees the Milt and Jean Cole Family Wellness and Fitness Center is on track to open before the 2013-2-14 school year, and is eagerly anticipated by students. "This will change the atmosphere on campus," she said. "Our students have asked for this facility for a long time, and they can't wait for it to open." A new outdoor courtyard will also open in the spring, replacing the space formerly used by the campus childcare center. The next need will be renovations to the Main Building. "This will have to be the chief focus for our campus for the next three years," she said. "It was built in the early 1960s, and nothing has been done to it since then." Jeremy Gibson, student body president, and Christopher Darr, president of the faculty senate, also addressed the trustees. Darr spoke about faculty salaries, and the need for equity among the campuses. Gibson has seen great changes on campus in his four years as a student, and said the addition of 16 new majors, an athletics program, and the upcoming wellness and fitness center, have created a much-needed sense of community. He said the missing piece to complete the community is student housing. "Having student housing would give us a place for our international students, and allow us to expand those opportunities," he said. "It would also allow many of our students who now commute long distances to live here and be more a part of our campus."